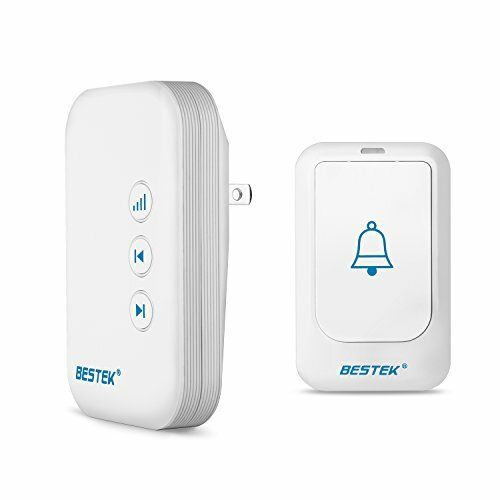 With different plugin chimes and button options, this BESTEK doorbell kit is perfect for your homes or large apartments. The extra chime makes it easier to hear the doorbell regardless of where you are in your home. Both chimes have 36 tone options and 4 volume levels. Self-learning design with over 1million frequency codes simplifies programming and helps prevent interference from other users or appliances. Each receiver can be worked with 4 additional push buttons and it will only retain the last 4 codes if you pair with more buttons; however you can pair multiple receivers with single button. Long press the volume button for 3seconds and press the push button at the same time, then you will hear the receiver was paired successfully. If you want to re-pair a new set of 4 push buttons, you may unplug the receiver for 30seconds, plug it in and repair the new set then all the preset codes will be cleared away. Please do not install the transmitter close to metal for better signal transmitting. Offers 18 Months Warranty and Friendly, Easy-to-Reach After-sales Service. Long Range Operating: up to 500 feet working range(820 feet in open area), either you are occupied in the garden or at the kitchen, the wireless doorbell reminds you that someone is calling from outside. High Quality Speaker with Good Voice System: Adopt high quality Φ29 speaker, the wireless doorbell provides better and louder voice apart from traditional speaker, ensures that you will never miss any visitors. Comes with 36 different ring tones with 4 levels of adjustable ringing volume(High / Medium / Low/ Mute), 110dB5dB, you can choose the chime you like. Pass Cold and Hot Weather Test: This wireless doorbell can work normally in -15℃ and 55℃ temperature, free from bad weather problem. With 18 months warranty and easy reach friendly customer service, you can totally buy the doorbell with confidence! WHAT YOU GET: 1 X Transmitter 1 X Receiver 1X 3M Sticker X1 Batteries， 18 months warranty and lifelong friendly, easy-reach customer service support.